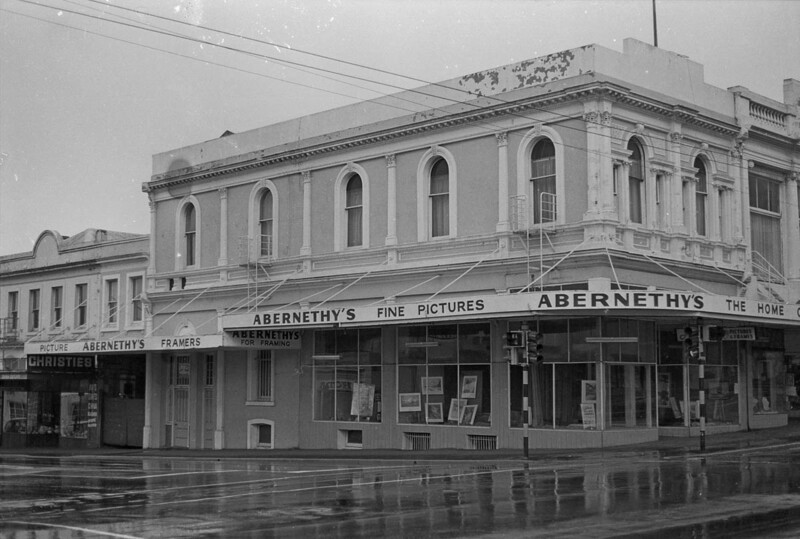 Albyn House as it appeared around 1960. Hardwicke Knight photo. 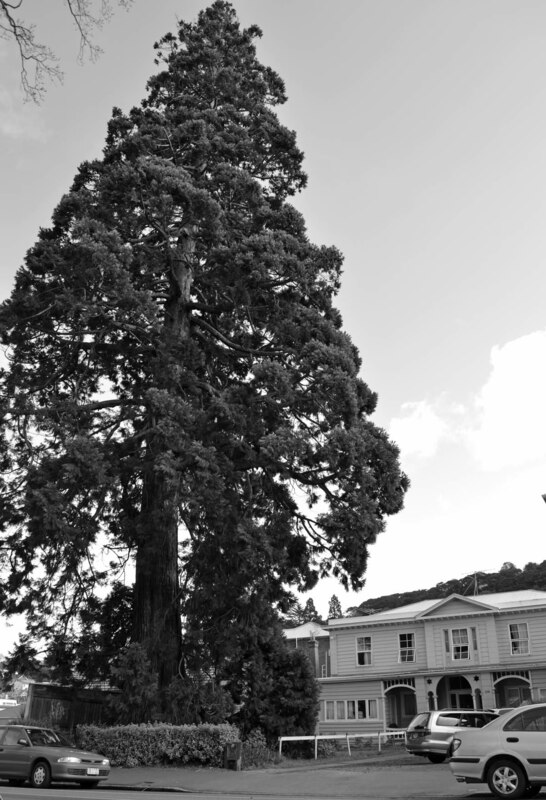 A magnificent Wellingtonia, thought to be more than 140 years old, stands opposite the North Ground on Great King Street. 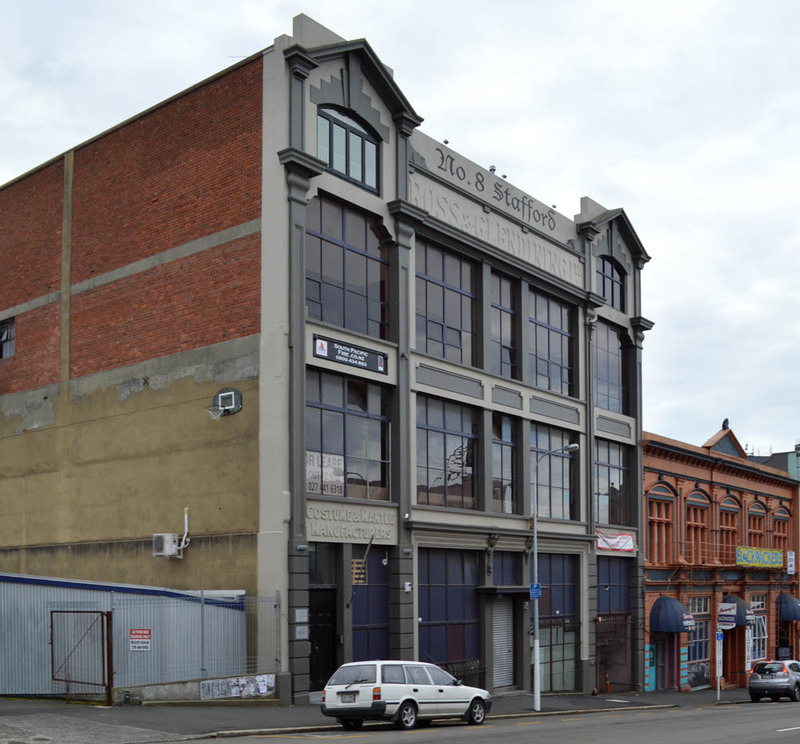 Its great height gives context to the even older wooden building behind it: Albyn House. 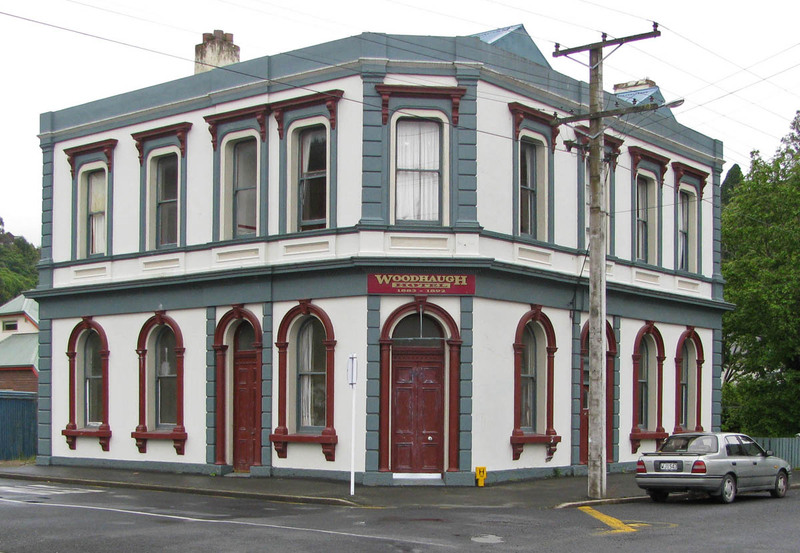 Built as the Albion Hotel, it predates the Otago Gold Rush, and might be the oldest surviving building in North Dunedin. 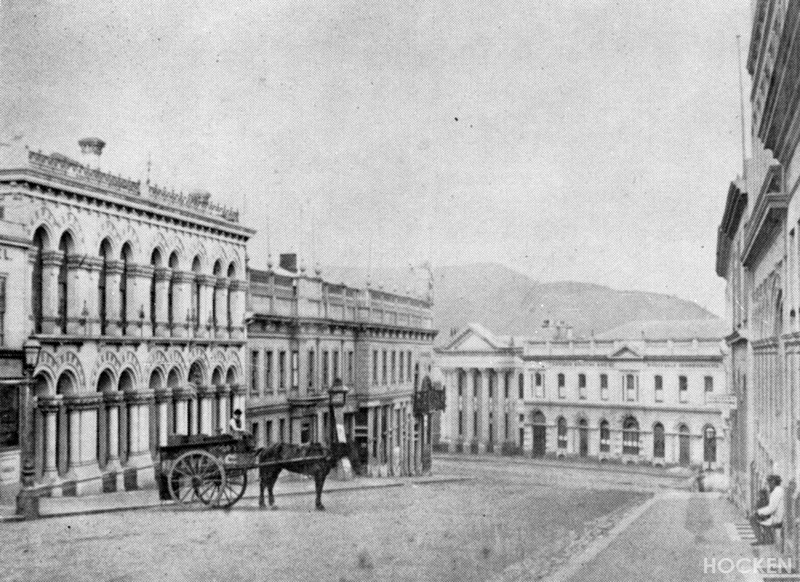 An early photograph shows the hotel set back from a roughly formed street, in almost rural isolation. 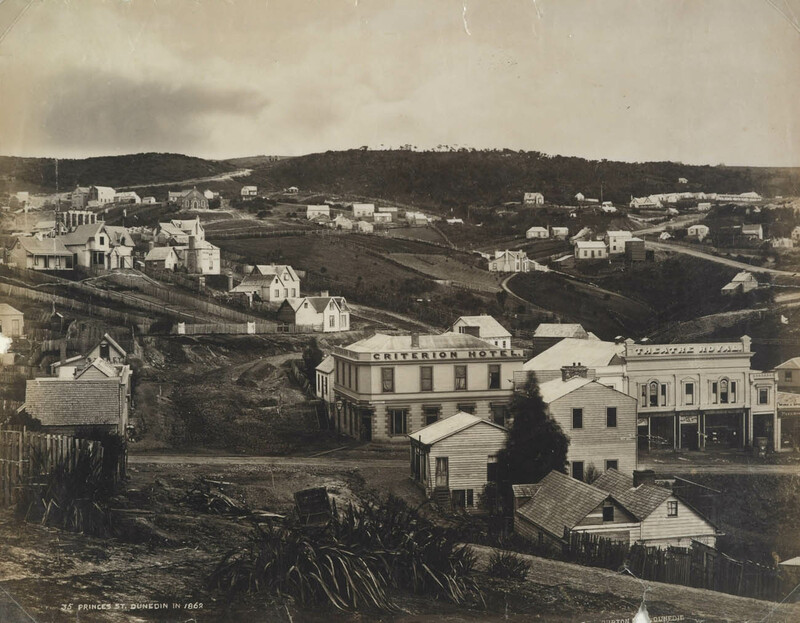 In 1861, a traveller whose observations were published in the Lyttelton Times found just two buildings of note in North Dunedin. 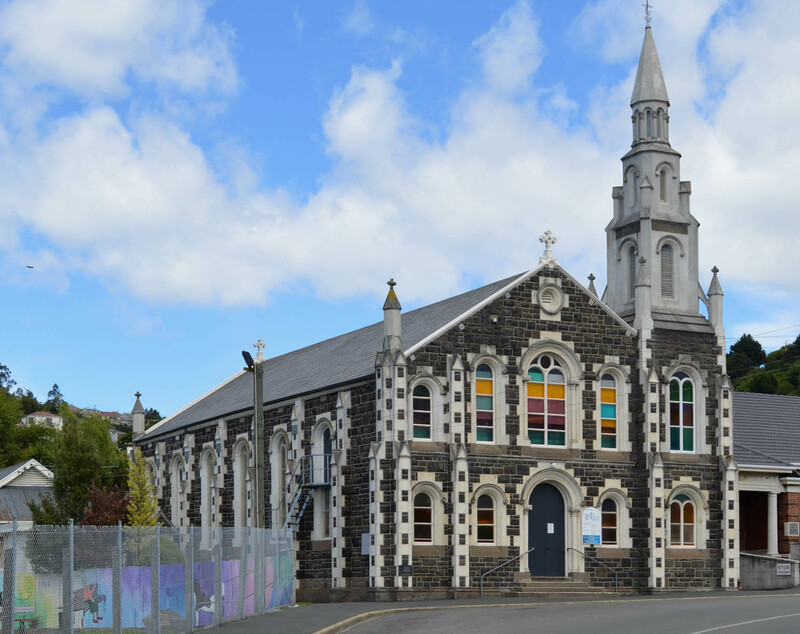 One was the original Knox Church and the other was the Albion, which he thought ‘for external appearance and internal comfort is superior to any in Canterbury’. 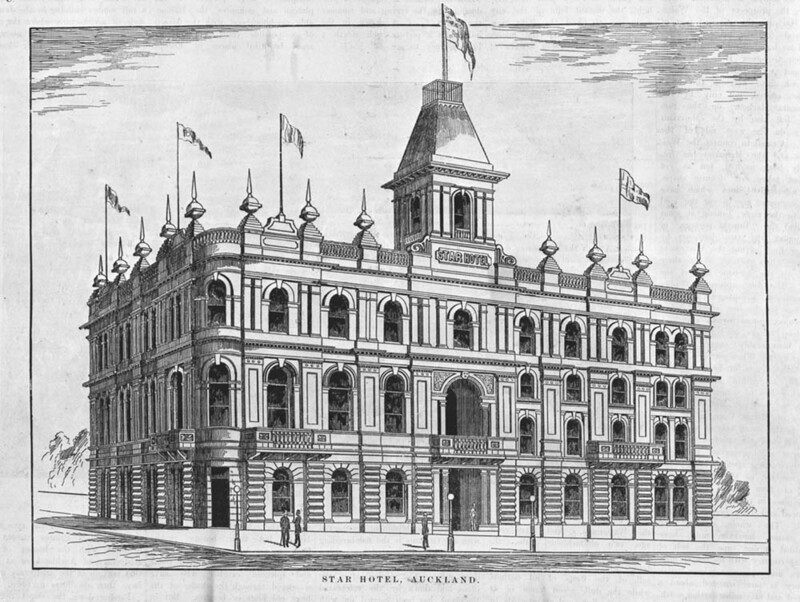 The two-storeyed structure appears modest now, but it was impressive in newly-hatched Dunedin, and a storekeeper in Great King Street advertised his business as ‘nearly opposite that magnificent building, The Albion Hotel’. 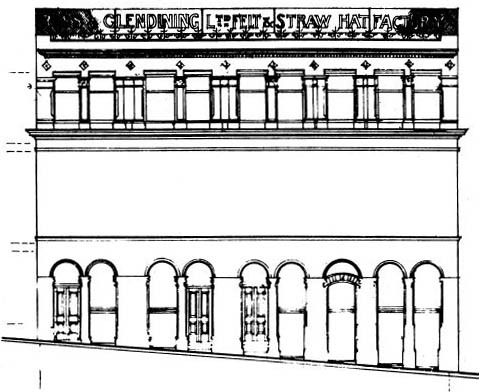 The architecture drew from the Georgian tradition, and with its small central bay and pediment was similar to George Greenfield’s design for the custom house (built 1862, demolished 1973) in High Street. 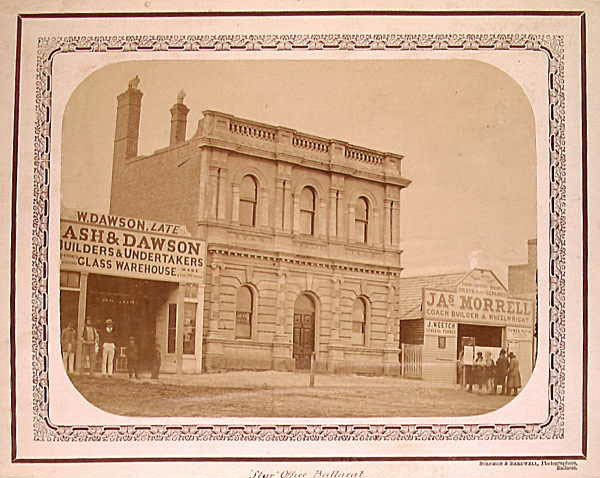 Where the custom house was stone and brick with a portico, timber materials and a verandah gave the Albion a more Colonial look. 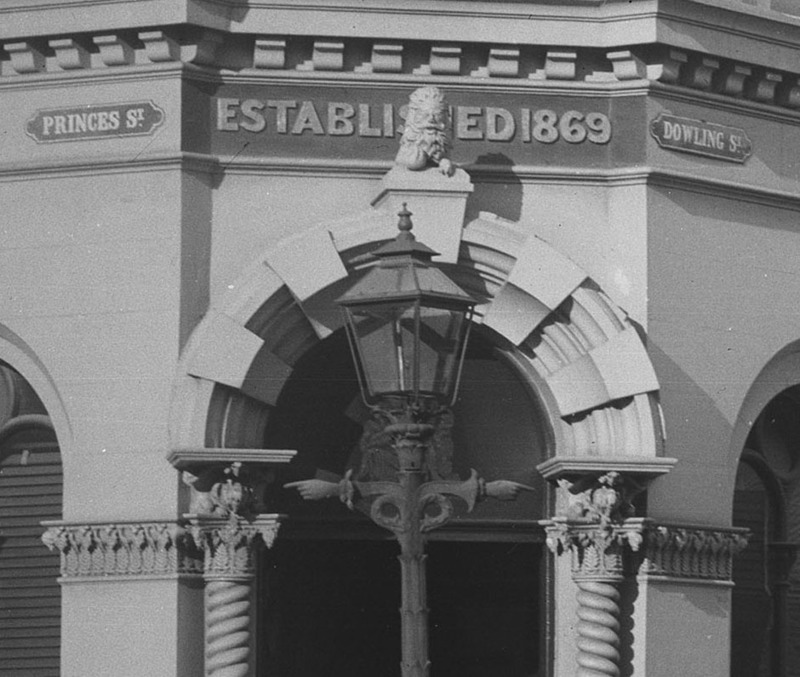 Arches and six-pointed stars were striking features of the entrance porch. 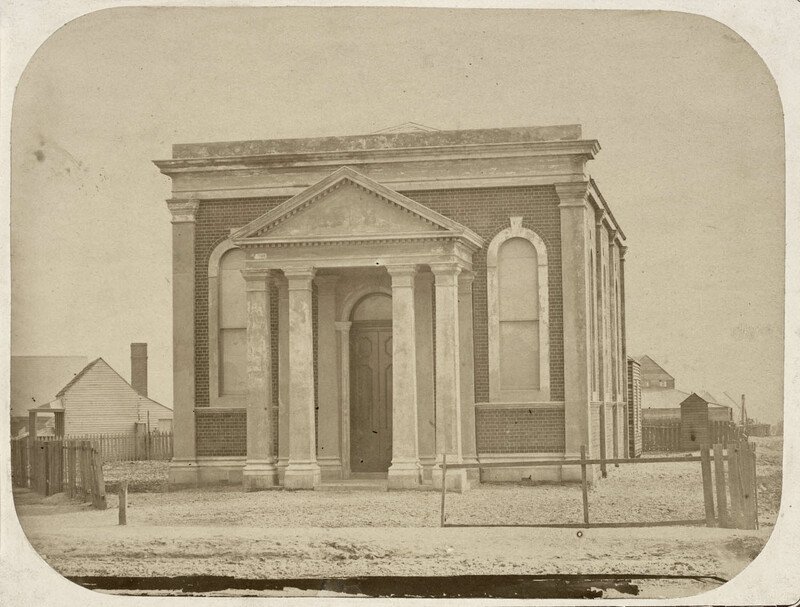 The building was also reminiscent of the brick Linwood House in Christchurch (1857, demolished 2011). 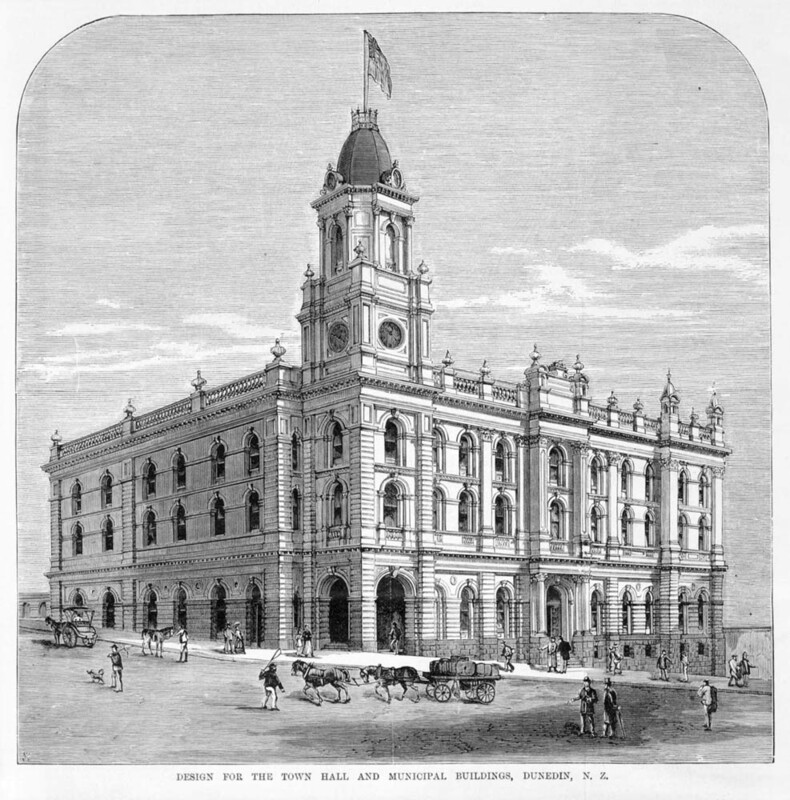 The first proprietors, John Henry Noding and Ernest Cleland Mais, were granted a license in April 1861, but by October Noding was the sole proprietor. 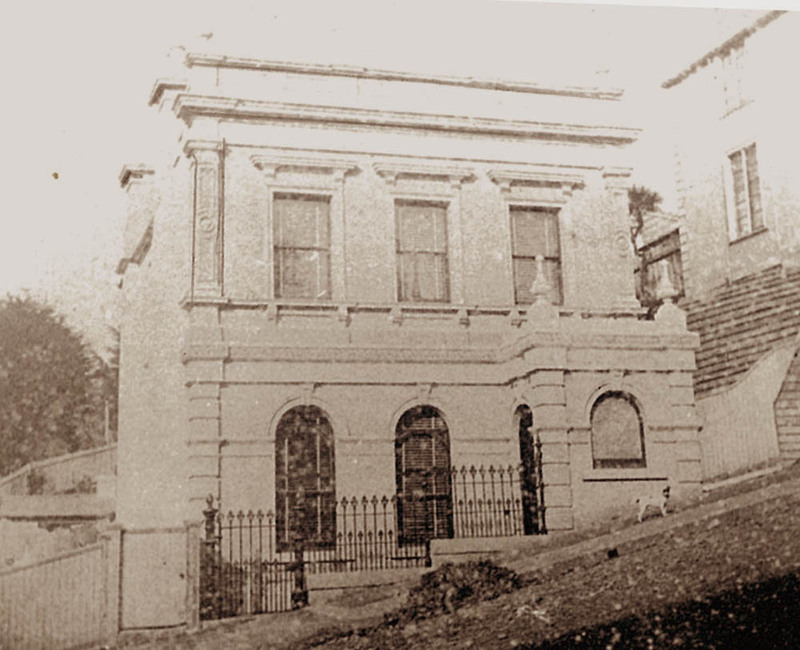 Like many advertisers he indulged in a little exaggeration, claiming that accommodation was ‘unsurpassed in the Colony, combining the freedom of a Hotel, with the comforts of an English Home.’ Robert Ellis opened livery and bait stables in connection with the hotel. 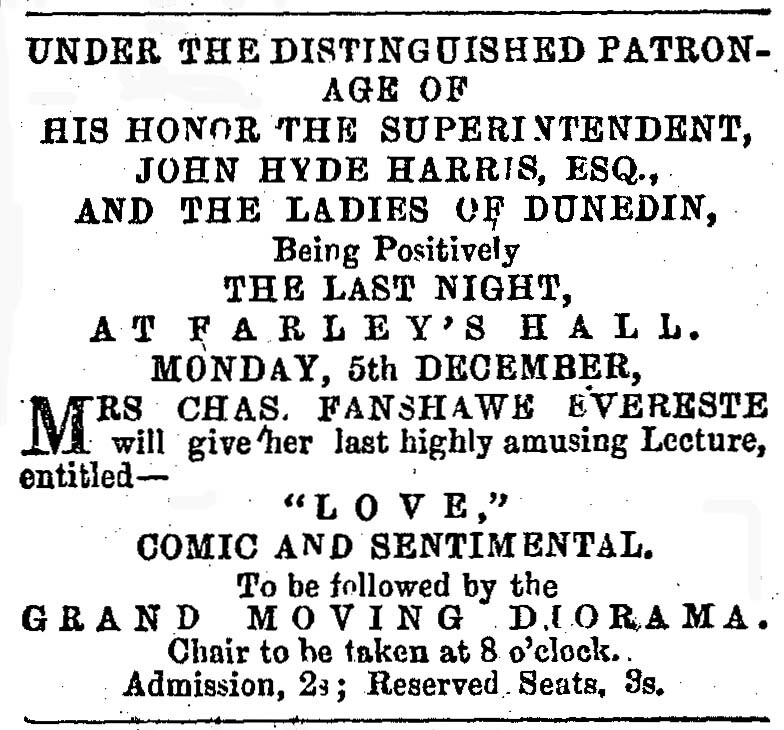 An advertisement from the Otago Daily Times, 25 November 1861. 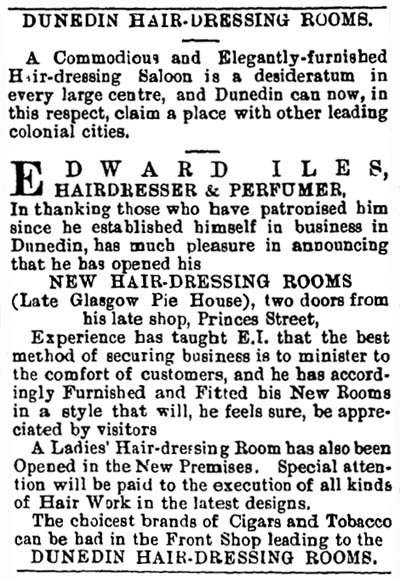 Ref: Papers Past, National Library of New Zealand. A wee kerfuffle made the papers at the end of 1861. Noding claimed that one of his guests, Captain Peter Greig, had demanded alcohol after hours and been very noisy, ‘playing leap frog and other improper games in the parlour’. 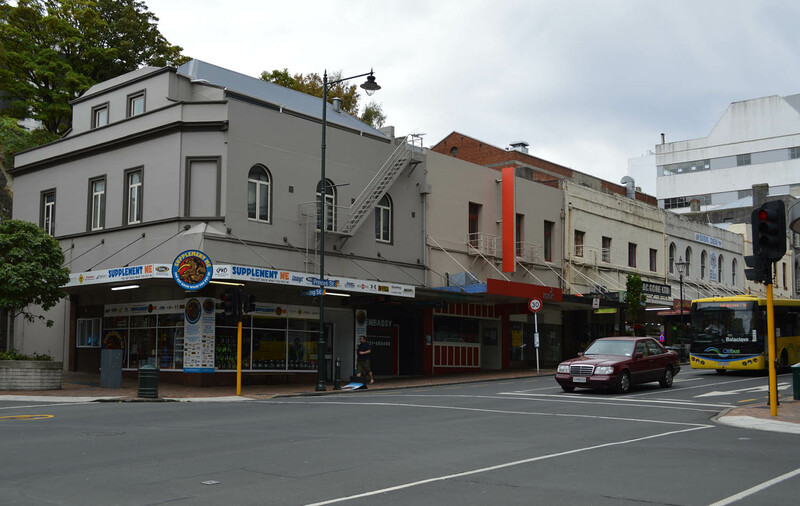 Greig was asked to leave, but refused and threatened to horsewhip his landlord. On Noding’s instructions the housemaid turned out the captain’s belongings and locked his bedroom, but he broke down the door. Greig was prosecuted, and following his spirited defence the magistrate remarked that he was obviously still under the effects of excitement. Greig apologised, explaining that he was not well, his feet were damp, and he had on a pair of new boots, which hurt his feet! He was ordered to pay damages, but fellow guests claimed he had done nothing wrong and criticised Noding as a poor host and a difficult man to live with. 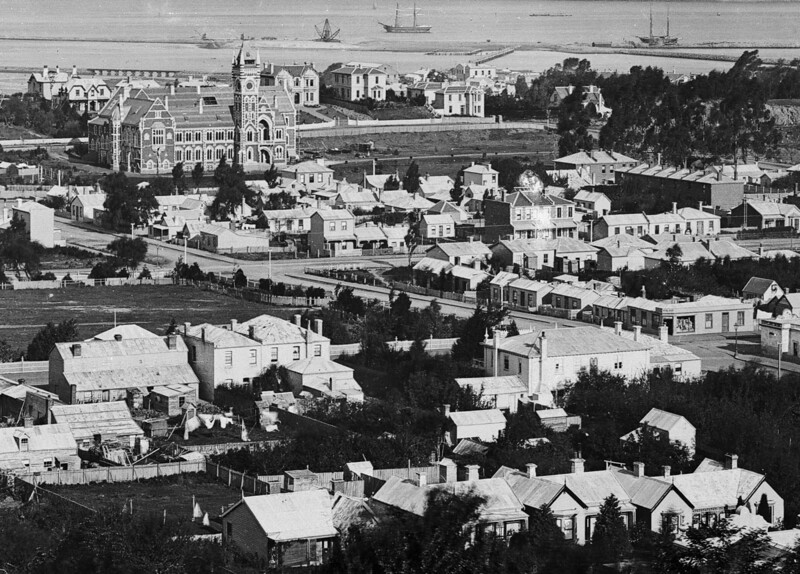 Five of them left the hotel in solidarity with the captain, and signed a letter in support, published in the Otago Daily Times. 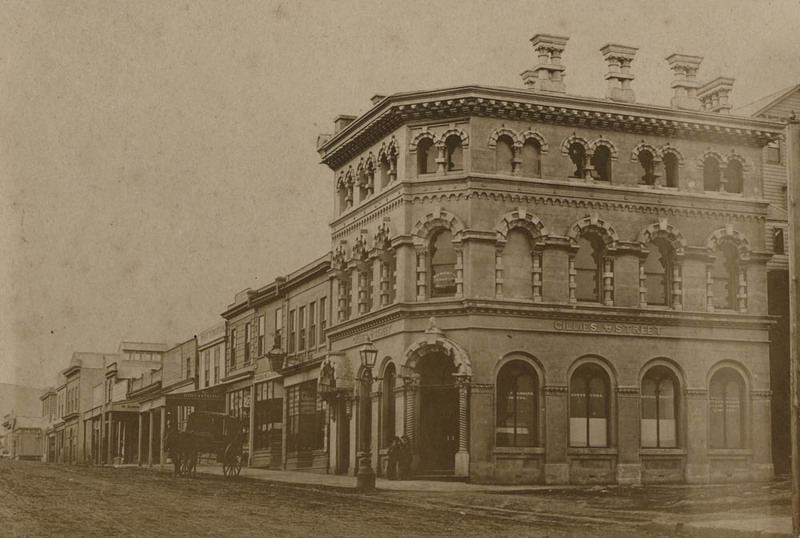 John McNeill bought the Albion at the end of 1862, and soon altered and reopened it, advertising ‘delightfully airy’ bedrooms, private sitting rooms for ladies, and all the comforts of home. The table, he boasted, was ‘daily furnished with every variety and luxury of the season, and the very best wines’. 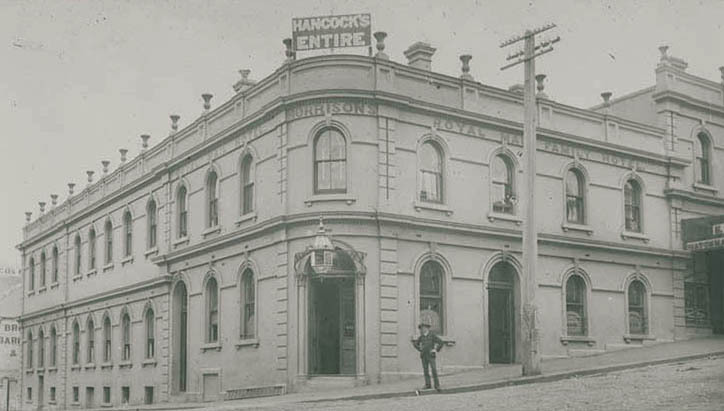 Within months the hotel changed hands again, with John Flanagan the new publican. 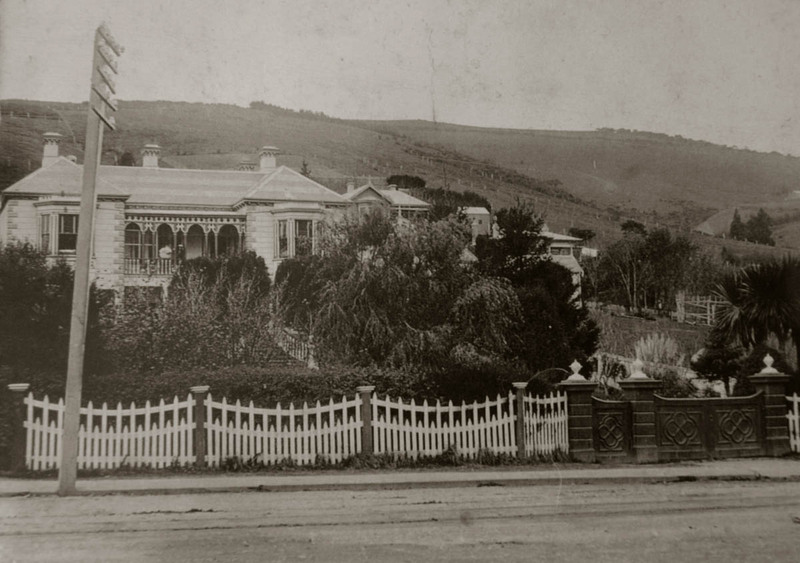 Members of the North Dunedin Cricket Club held meetings in the building, including one on 6 February 1864, the day they officially opened the North Ground. 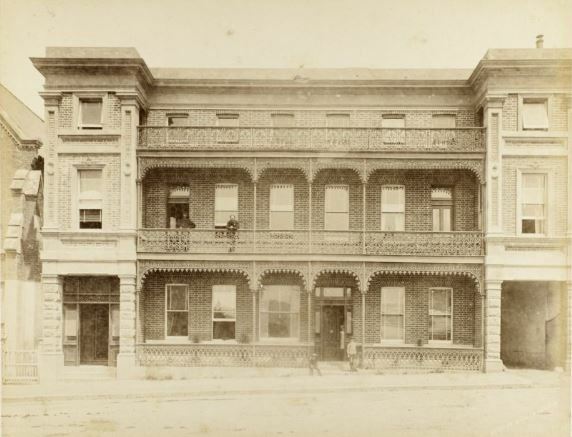 On one occasion a perambulator was stolen from the verandah and taken on a little adventure as a ‘lark’ – evidence, should it be needed, that alcohol-influenced pranks in the area predate the university and its students by some years. 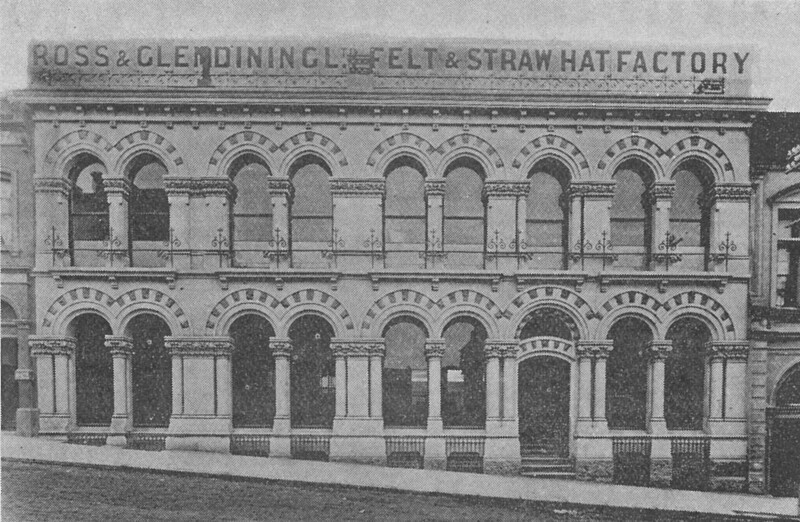 Flannagan failed to make a success of the business and the hotel closed in 1865. 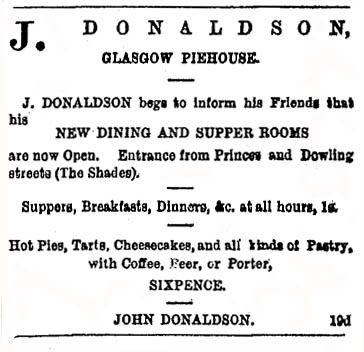 After being bought by the mortagees, John McNeill and James Finch, it was sold to Daniel Campbell in 1866. 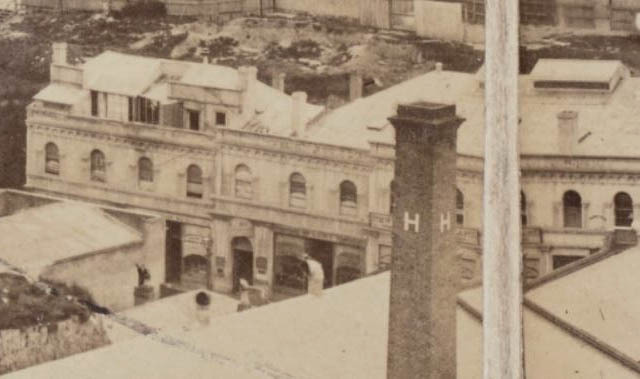 Detail from a late 1860s photograph showing the building from the rear (at centre). 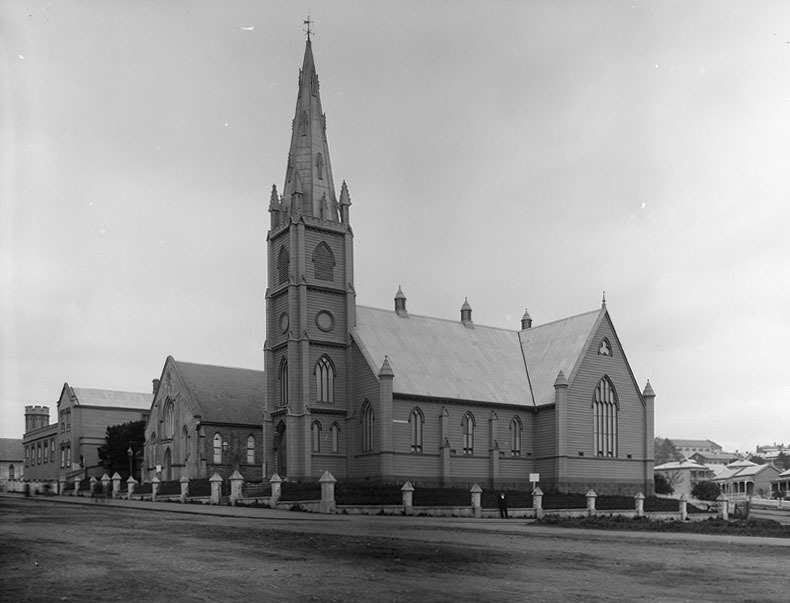 All Saints’ Church is also prominent. Ref: Hocken Photographs Album 073. 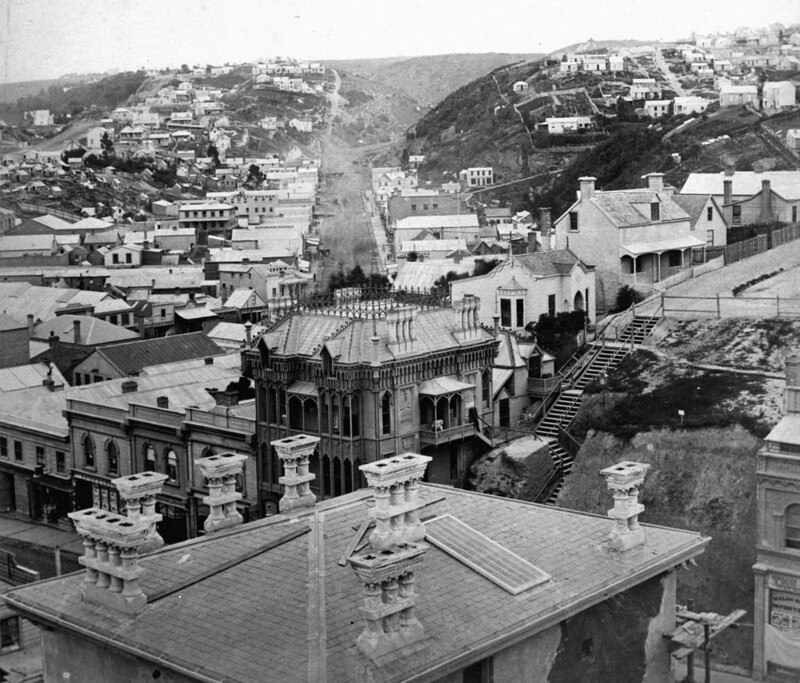 An early 1880s view showing Albion House (as it was then known) at the centre right. Note the size of the tree. 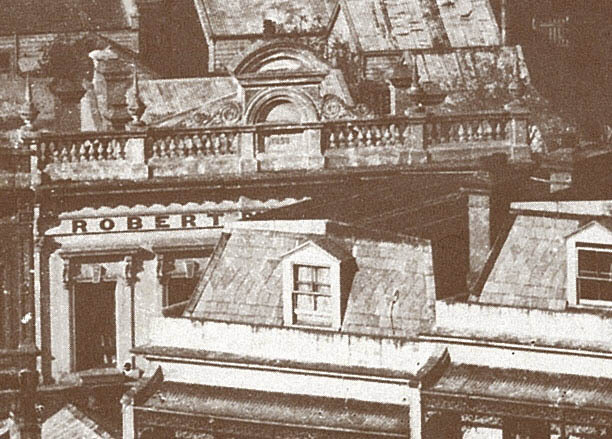 Detail from Burton Bros photograph. 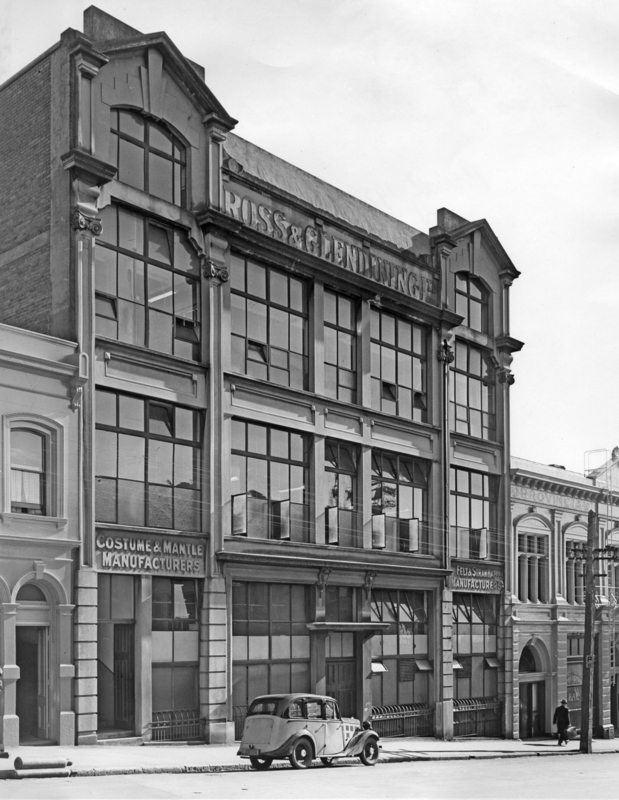 Ref: Te Papa C.012457. 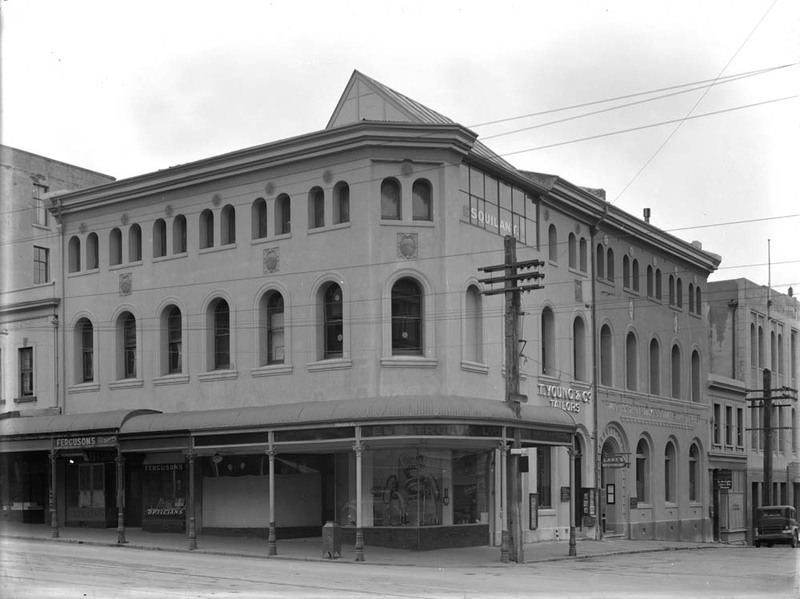 For the next eighteen years the building was Campbell’s private residence, and was known as Albion House. 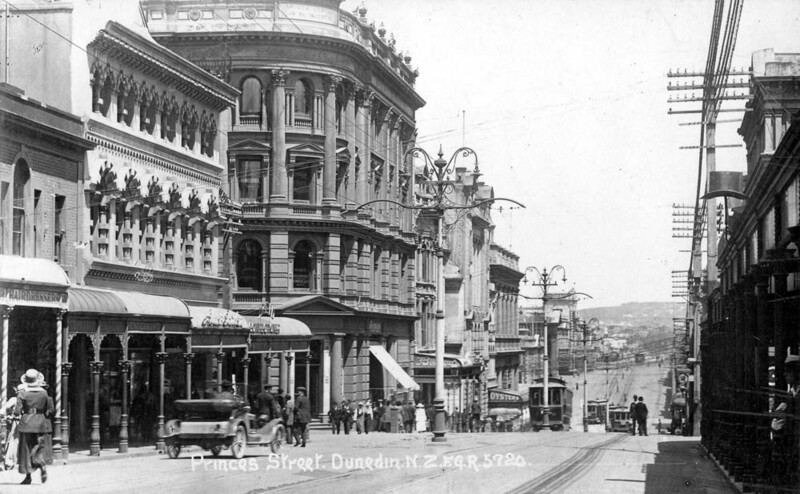 Campbell had arrived from Edinburgh in 1851, and was the first printer and manager of the Otago Witness, and later Managing Director of the Otago Daily Times. 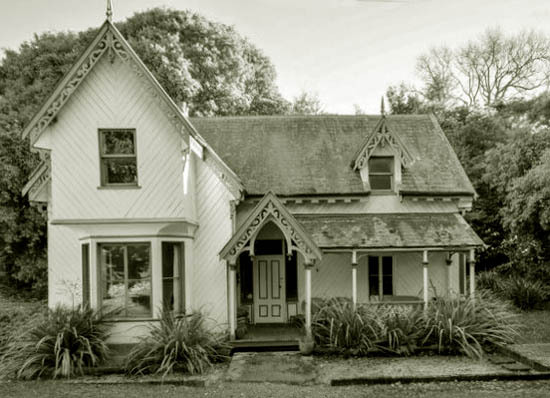 His daughters Maggie and Nellie were each married at Albion House by Rev. Dr Donald Stuart. 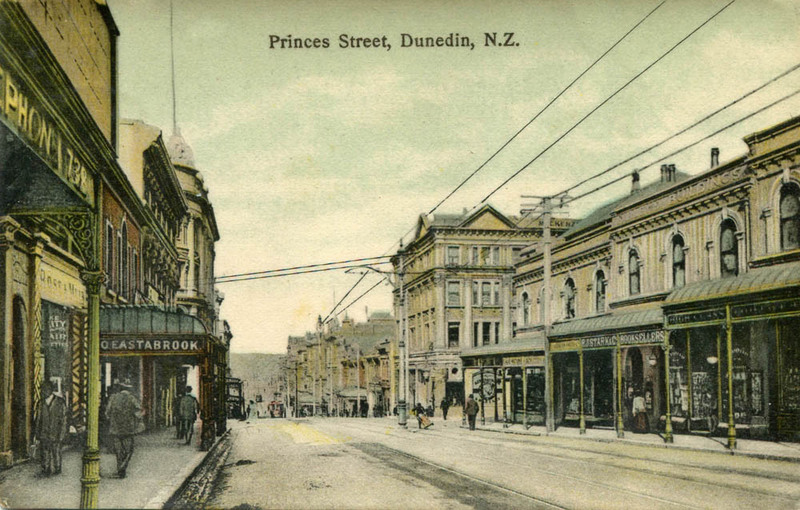 Campbell left Dunedin in 1883, and in 1884 a boarding house was established in the building by Mrs Susan James. 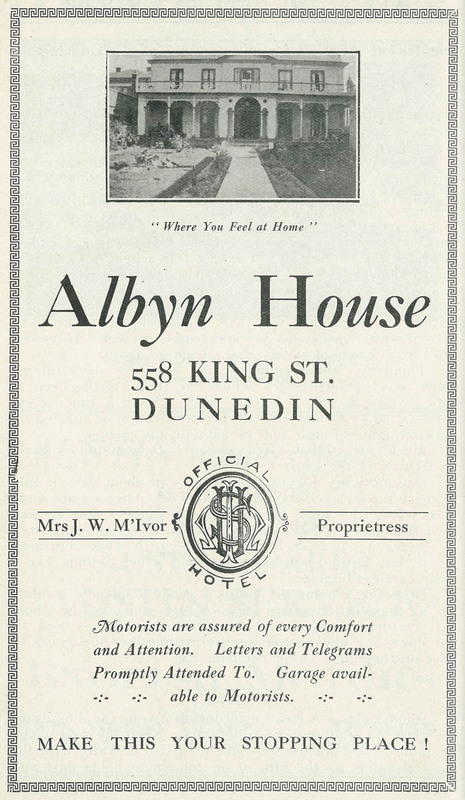 She initially leased the property before purchasing it in 1888, when she changed the name from Albion House to Albyn House. Albion is the oldest known name for the island of Great Britain, and Albyn is a variant with romantic literary associations. 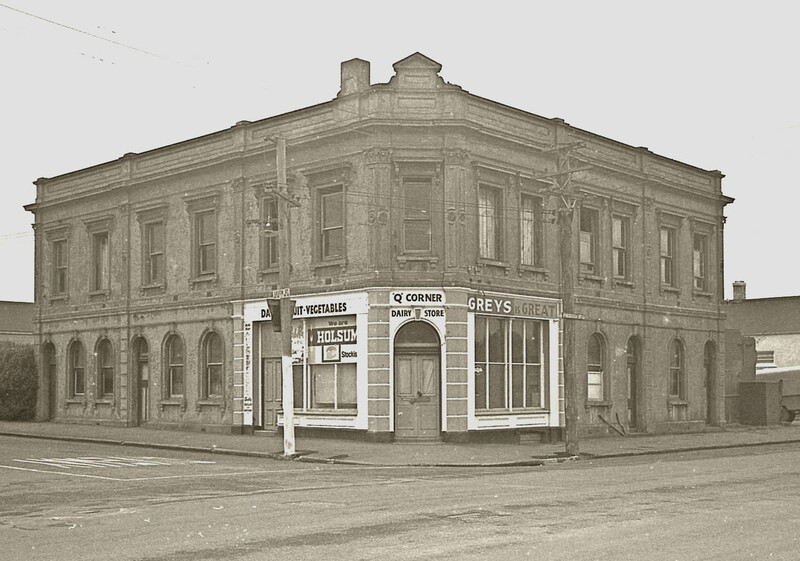 It is not known why Mrs James changed the name, but it may have been to avoid confusion with another Albion House, or the Albion Hotel in Maclaggan Street. 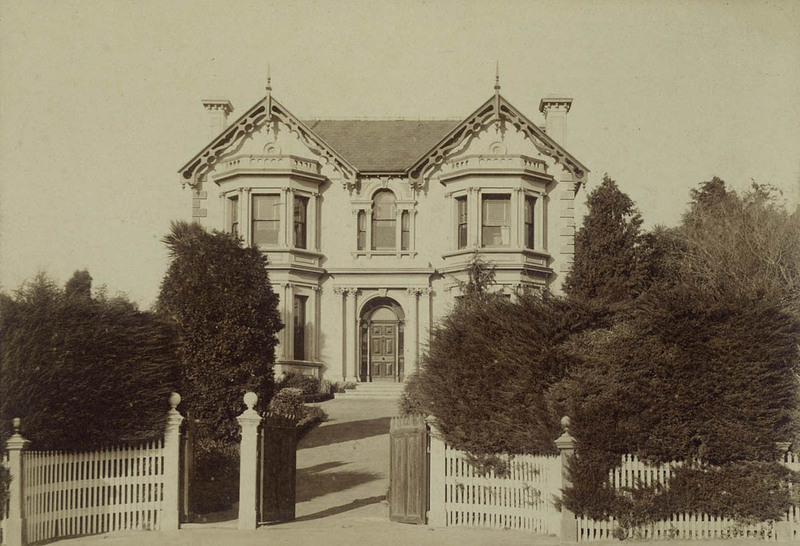 Susan James ran Albyn House until 1901, and after leasing it to other operators returned to a hands-on role from 1908 to 1914. 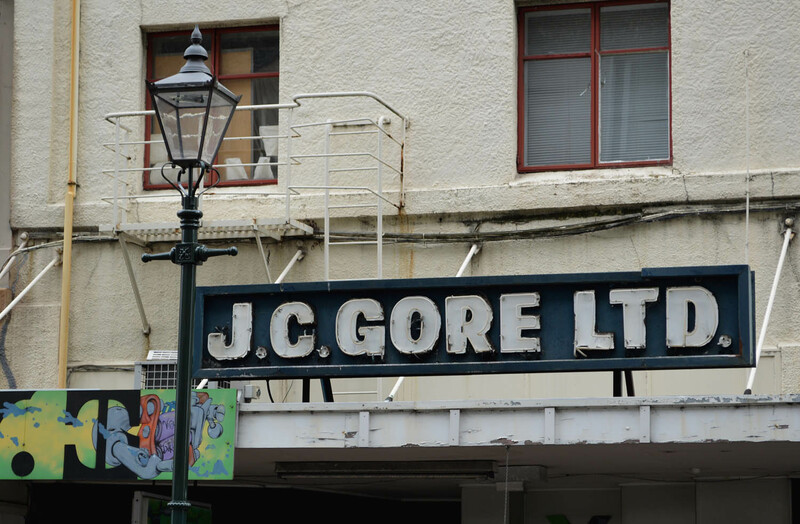 It was briefly run by J.A. 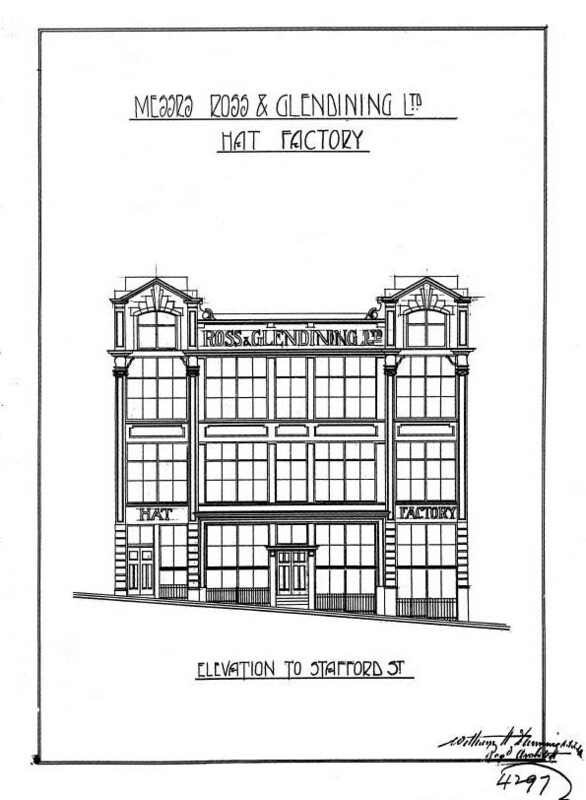 Goodman, and his sale notice in 1916 gives an interesting list of some of the furnishings: ‘Walnut sideboard, leather suite, dining table, fenders and brasses, occasional tables, poles and curtains, pictures, linoleums, Axminster carpet, carpet runners, wicker chairs, hall stand, overmantel, ornaments, china and crystal, double and single bedsteads, bedroom suite, wardrobes, duchesse chests, washstands, ware, toilet glasses, bedding, blankets, napery, kitchen furniture, utensils, garden tools, furniture of 20 rooms’. 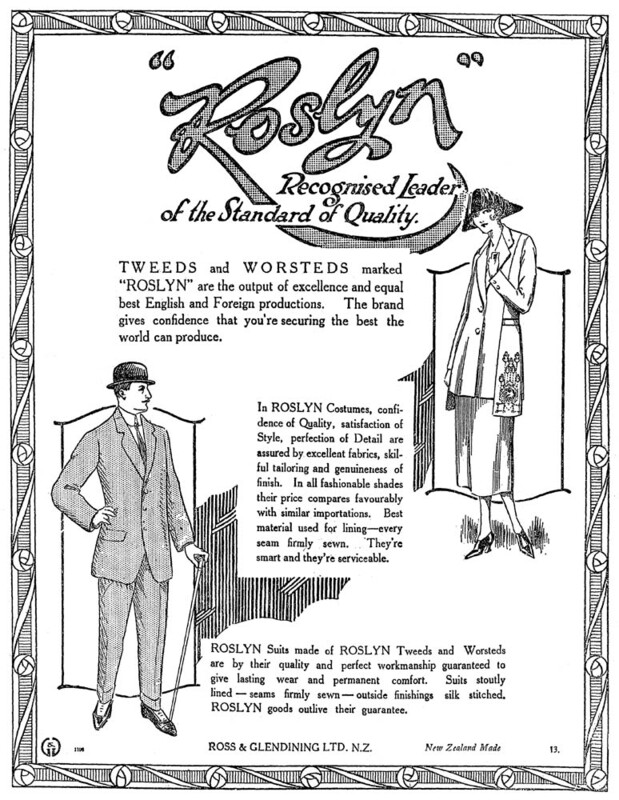 An advertisement from the Otago Motor Club annual, 1930. 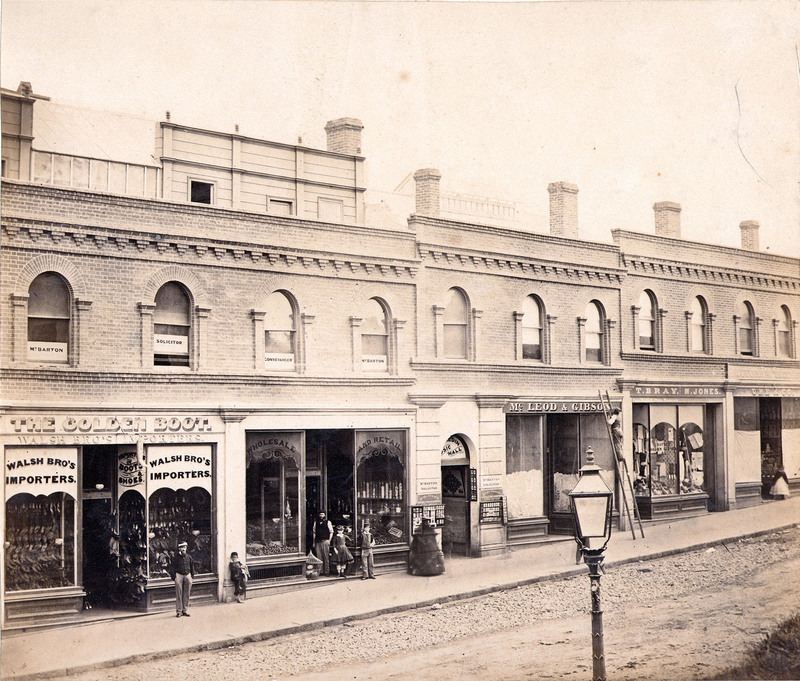 The verandah was still open at this time. 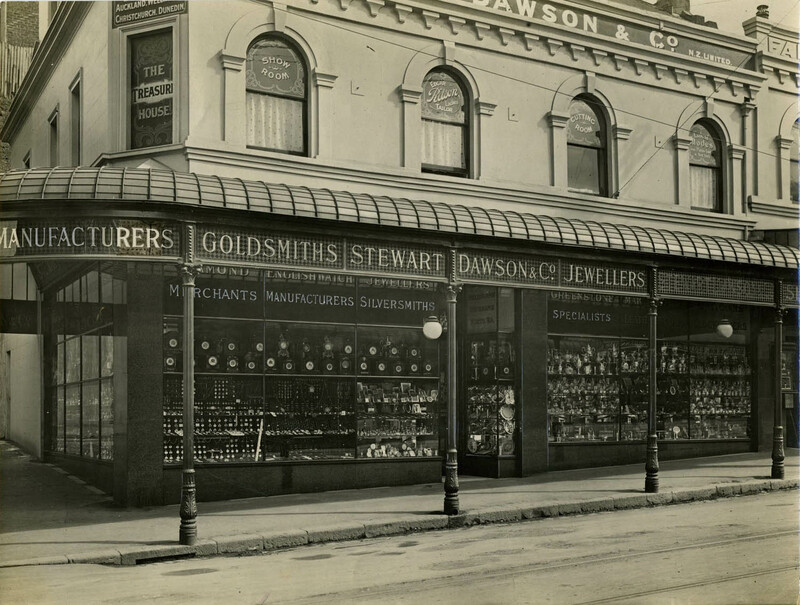 Later proprietors included Margaret Durrand, Jane McIvor (c.1919-1932), Annie Christeson (1936-1960), Ivy Harborne (1960-1973), and A.P. 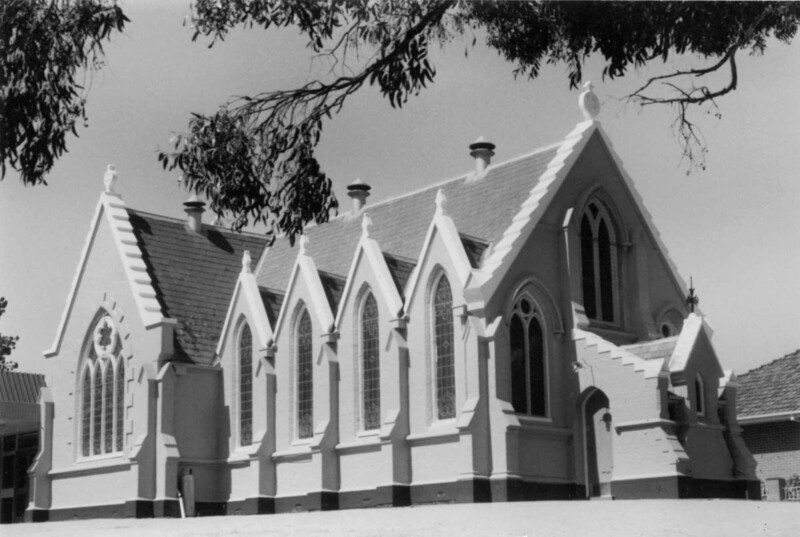 Sutherland (1973-1987). 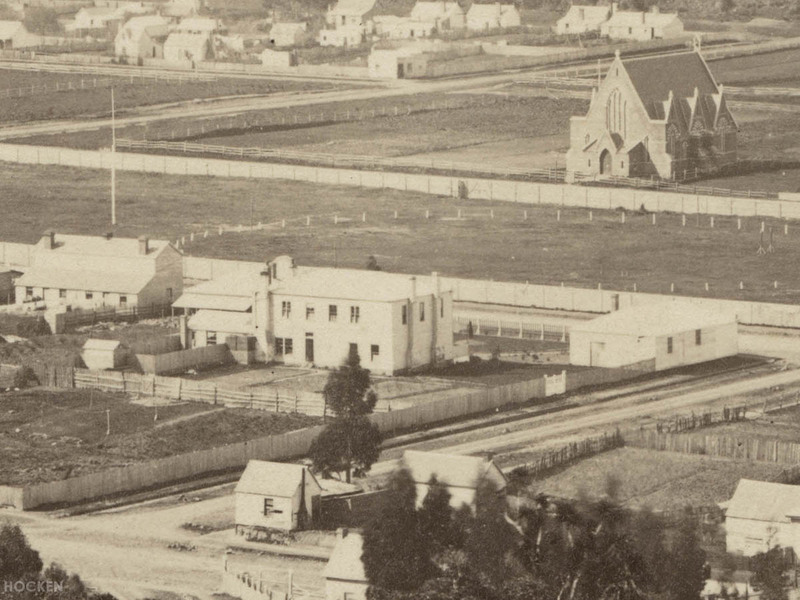 Residents in the early years included clergy, medical students, clerks, and music teachers. Notable individuals included W.H. 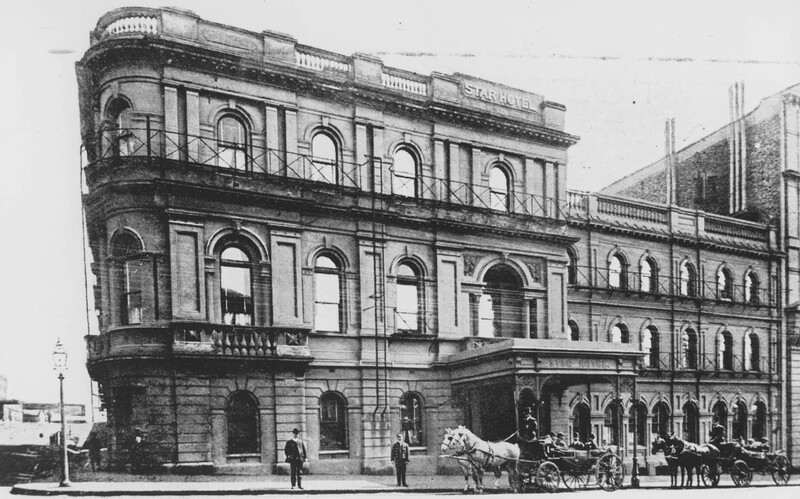 Trimble, who became the first Hocken Librarian, and Whampoa Fraser, the first principal of what is now Fraser High School in Hamilton. 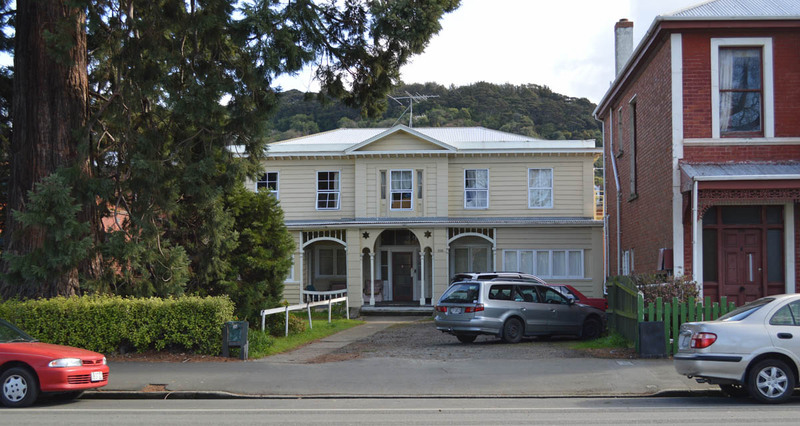 Albyn House was also used by tourists and travellers, and increasingly by single men looking for low-cost accommodation. 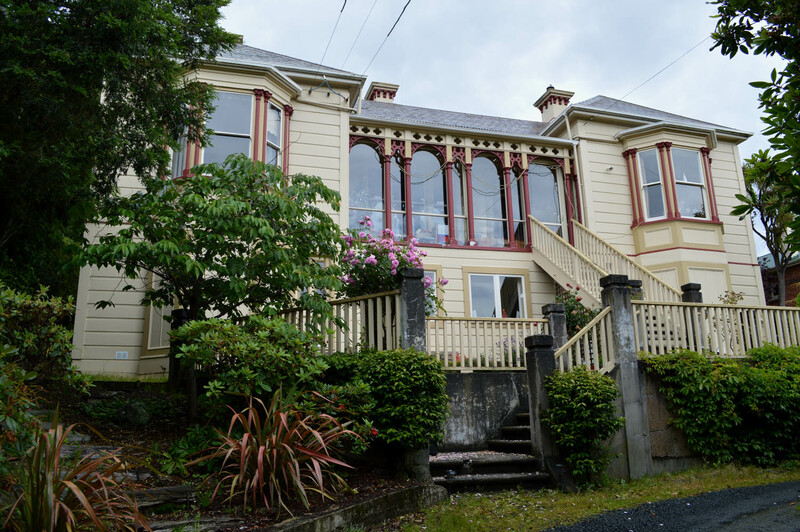 In 1970 it was converted from a boarding house to bedsits. 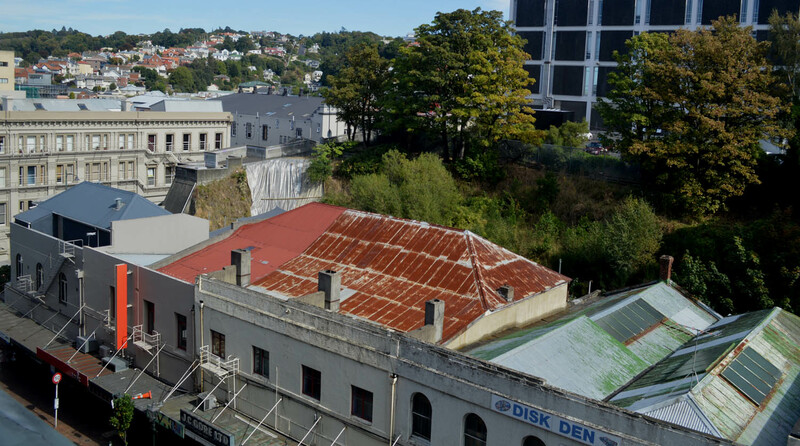 Simon Rae remembers living there in 1960, when he was a student in his first year at the University of Otago. 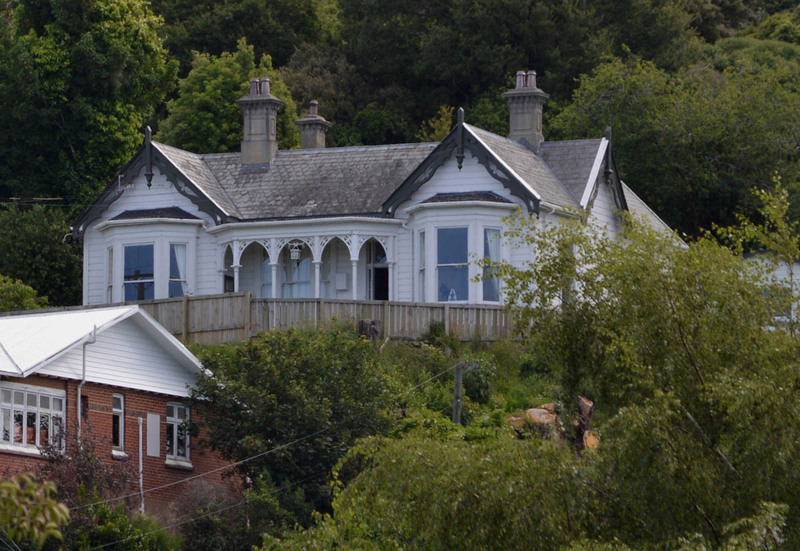 ‘Mrs Chris’ was the landlady and the boarders were ‘all younger single men, a wonderful mix, workers and students’. They knew the times when Sputnik could be observed and would go over to the North Ground to spot it in the night sky. Some additions to the building appear to have been removed, as have the brick chimneys that were attached to the external walls. A stair mysteriously leads up to the attic space. 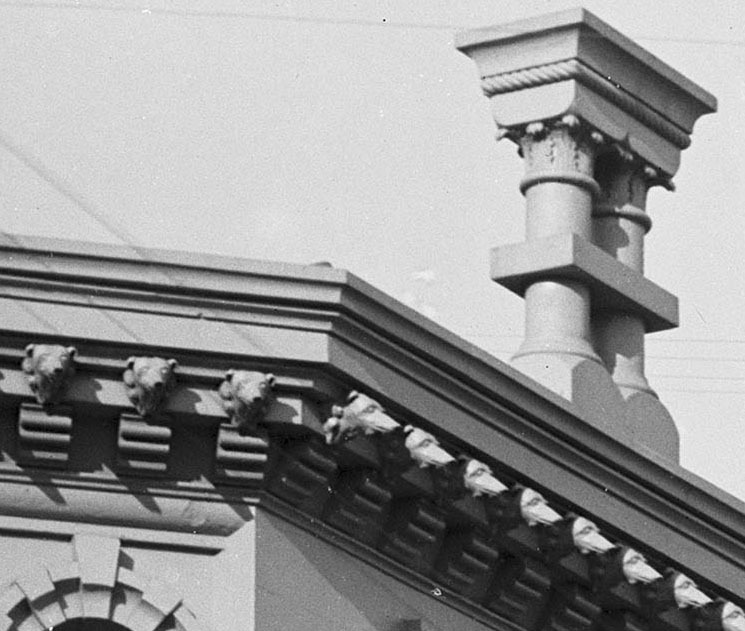 Decorative ironwork that once graced the frontage has gone, as have four finials from the parapet, and aluminium-framed windows make incongruous replacements for the original double-hung sashes. 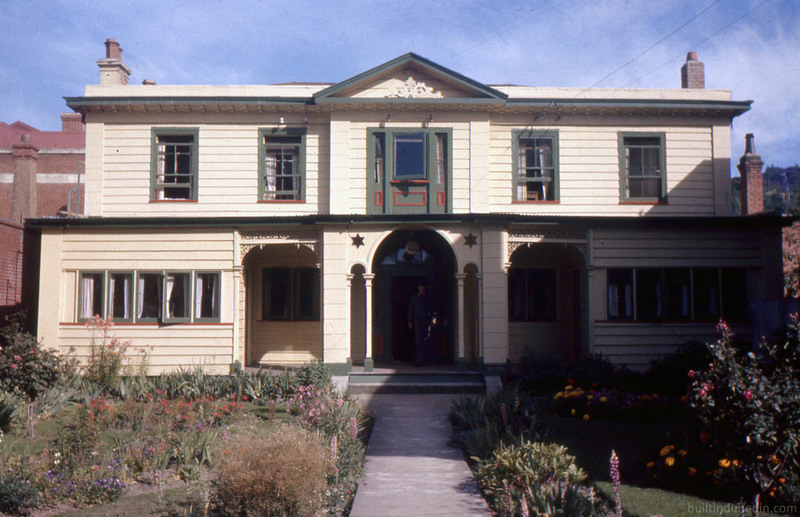 The verandah was partially closed in during the mid-twentieth century. 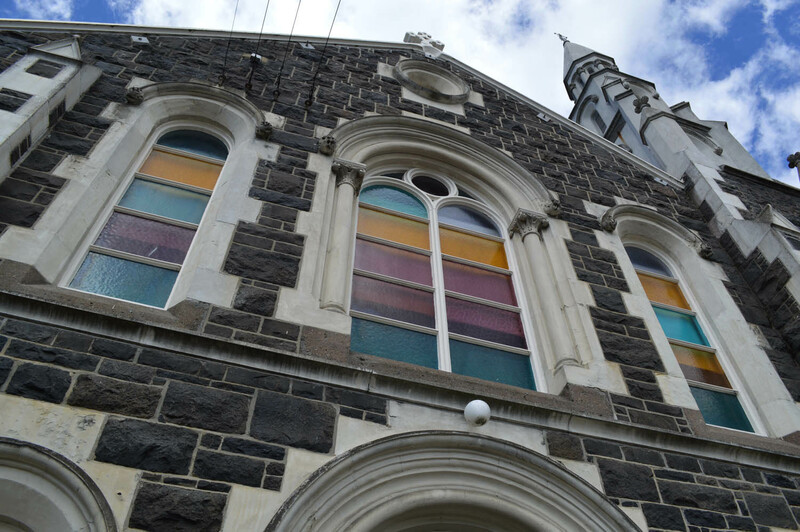 After 154 years however, however, the building retains the essentials of its original character. 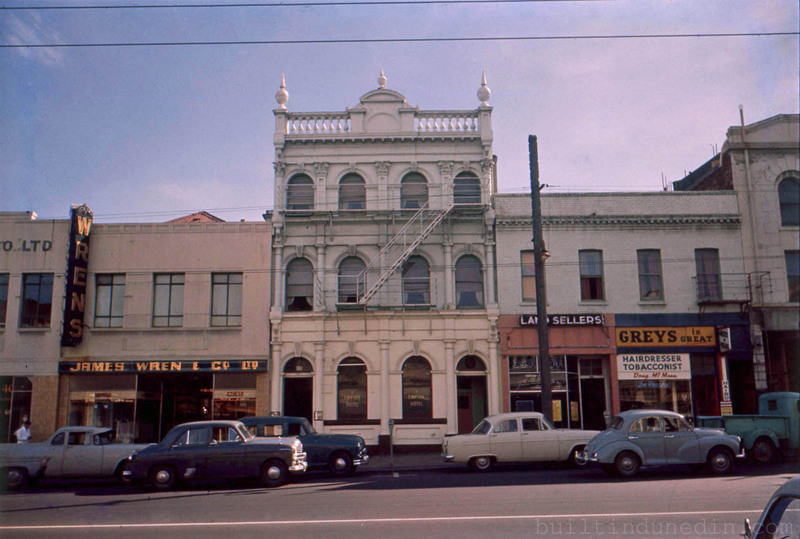 The buff colour scheme, of a type once common, adds to its old-fashioned charm. 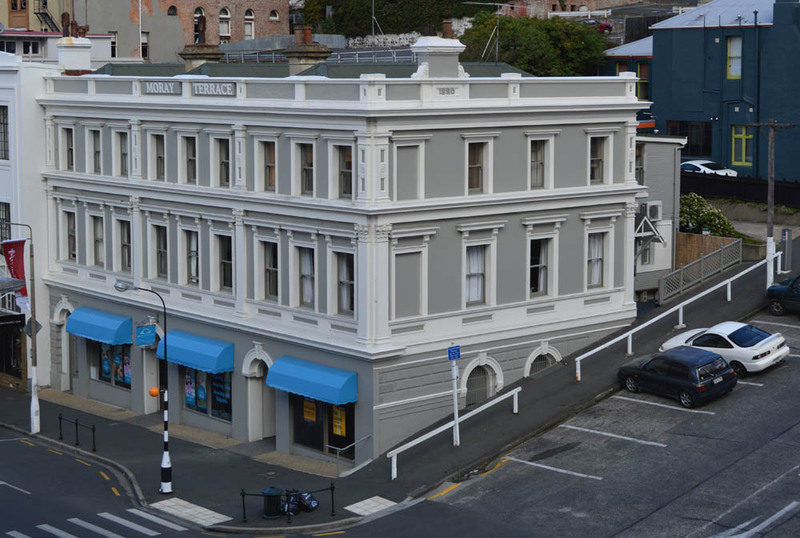 Albyn House is not only possibly the oldest building in North Dunedin, but also likely Dunedin’s oldest remaining hotel building. 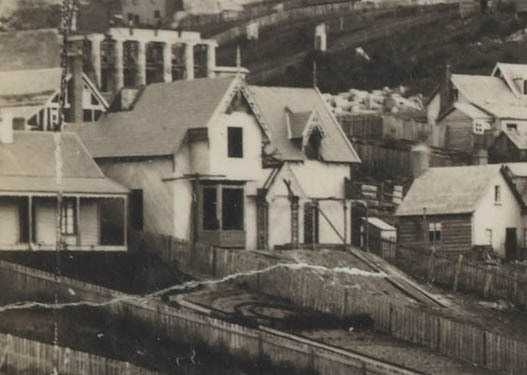 It survives as one of the few built links to the city’s early pioneer days. 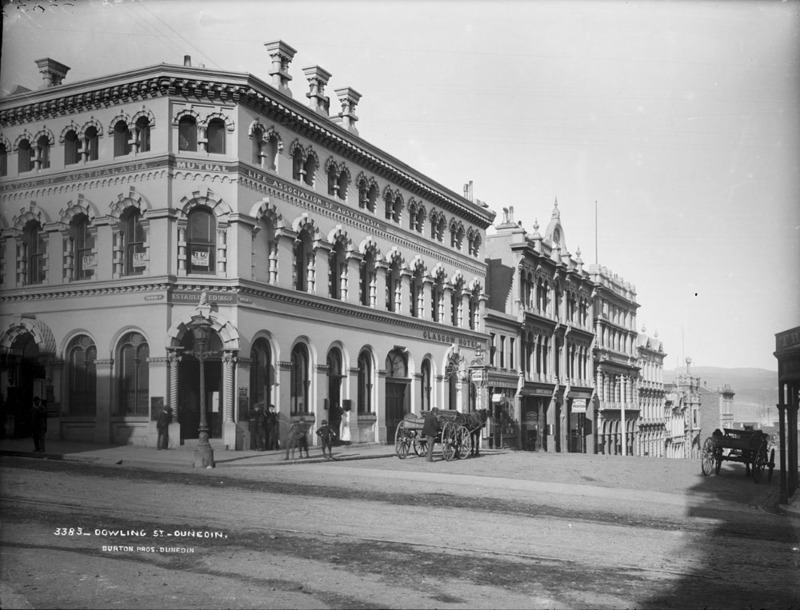 Otago Witness, 20 April 1861 p.5 (license granted), 8 June 1861 p.5 (cook, housemaid, waiter), 27 April 1861 p.3 (‘magnificent building’), 20 July 1861 p.4 (Ellis’ stables), 26 October 1861 p.4 (partnership dissolved), 20 Feb 1864 p.14 (perambulator); Otago Daily Times, 7 December 1861 p.2 (Noding and Grieg), 8 December 1862 p.2 (sale notice), 20 January 1863 p.3 (advertisement), 16 June 1866 p.5 (disputed settlement), 19 June 1866 p.5 (disputed settlement), 6 February 1864 p.4 (opening North Ground), 29 January 1878 p.2 (wedding), 25 November 1879 p.2 (wedding), 31 March 1884 p.3 (boarding and accommodation house established), 23 July 1885 p.1 (advertisement), 26 October 1888 p.3 (purchase by Mrs James), 1 April 1889 p.1 (Albyn House), 4 August 1908 p.8, (departure of Mrs Heatley), 26 October 1908 p.2 (return of Mrs James), 21 February 1914 p.12 (for lease), 12 February 1916 p.14 (A. Goodman); Lyttelton Times, 4 January 1862 p.9 (description of Dunedin). Thanks to William Duncan for his help when I visited the site. 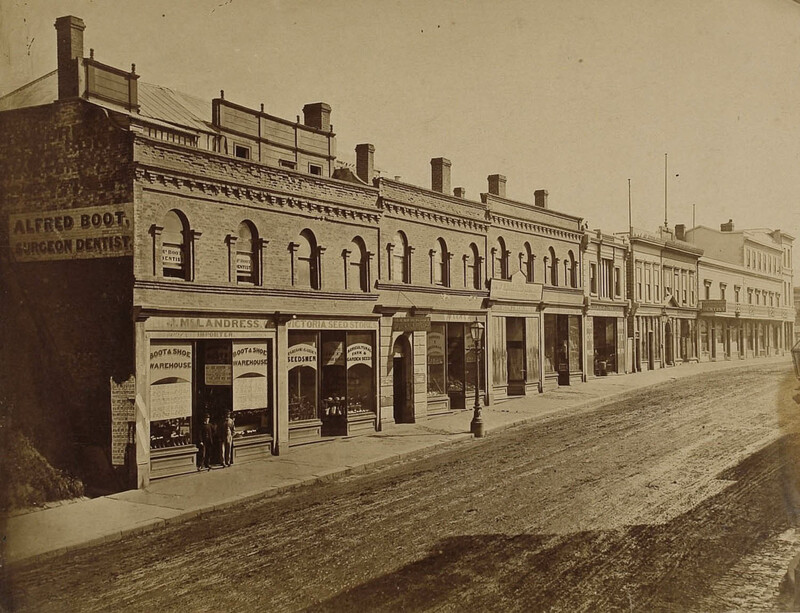 This entry was posted in Uncategorized and tagged 1860s, Albion, Albyn, Boarding houses, Daniel Campbell, George Greenfield, Georgian, Great King Street, Hotels on 21 September 2015 by David Murray.